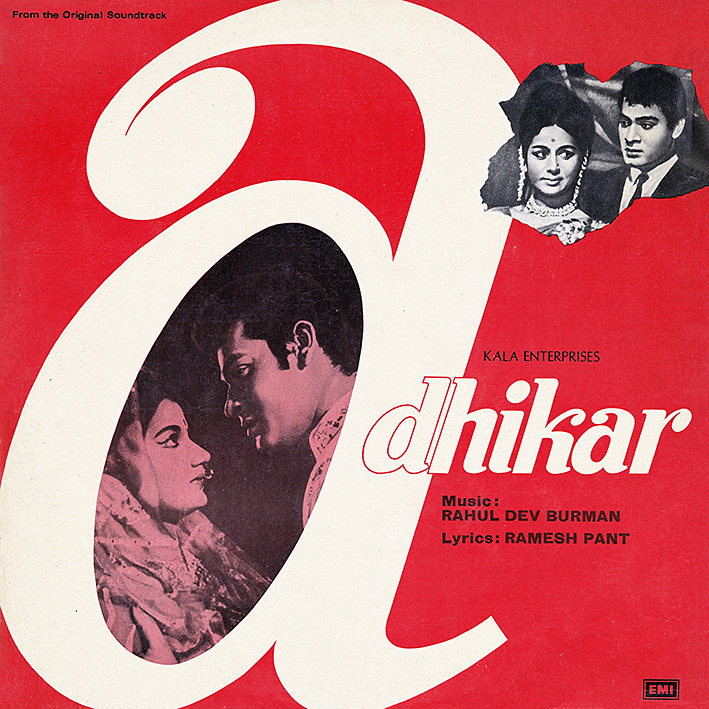 'Adhikar' originally appeared on this blog as an EP, posted some 12 years ago. It seems I kind of liked it at the time, but without being overly impressed. I like the LP better, partly due to it including 'Sharab Nahin Hoon', featuring Asha Bhosle on vocals and Helen on screen. I'm a sucker for those two doing RD Burman songs. Additionally tracks such as 'Koi Mane Ya Na Mane' and 'Tum To Ho Sabke Rakhwale' make more of an impression on me now than they did then, don't ask me why. And 'Fashion Ki Diwani' still sounds pretty irresistible. It looks great too if you can find the film clip (someone pulled it off YouTube before I finished writing this); appealingly mod. If the above post gave you some joy or value, if you've ever been inspired by the contents of this blog, please consider leaving a tip. In addition to showing your support, you could gain access to currently unavailable downloads. Or why not buy a copy of MFT3F's unique guide to 100 Bollywood Soundtracks Every Music Lover Ought To Hear? Either way, you'll be letting me know the work I've put into this matters to you, and you'll be motivating me to continue. Thank you a lot. I hope you never run out of soundtracks. God Bless. Thank you so much for sharing. Excellent rip. Appreciate your effort. I believe this is the second pressing LP and the first pressing was ring Odeon and blue based cover. Once again thanks for the previous EP upload. It is indeed; the 1st pressing's full-colour artwork is in fact much nicer. I'd imagine for budgetary reasons, re-pressings had a tendency to come with black & white covers, some of them blandly generic. I always try to find initial pressings, but there are times I need to make do (at least temporarily) with later ones. Haa haa... I still have the original blog post and tracks downloaded, pc! Dated March 13, 2007. Dang! Mine would be on an external HD and/or the cloud; chances are I'd struggle to find them. On the plus side I still have easy access to the actual EP. There was a lot of wholesale composing by the legendary RDB back then, by the sounds of.it. I'm.fortunate & blessed to have hundreds of 60s and 70s prime bollywood vinyl and later CD incarnations . RD features heavily as rajesh khanna and Kishore Kumar combined with him to make pure magic on and off screen soundtrackwise. My wholesale.comment, is that films tended to be realised in a slew within a short period and so Adhikar, Puraskaar, Ehsaan, Sanjog, Lakhon Mein Ek , Pyar Ki Kahani were mostly (for example) released in 1970/71. Ergo, songs leftover or Not used for one project, were used elsewhere. The oddities happen when you go further into the 70s. Apart from the wholesale use of ERS (a cheap way to apply electronic delay and basic eq to one channel, in order to simulate stereo) for 5 years or so (not on instrumental albums , oddly enough, which were in actual STEREO ), you'd get songs from years back on albums where they clearly sound out of it. Humshakal (1974, again RDB) has kahe ko bulaaya, which has a dated sound compares to the rest of the songs on there. Some of which featured spring reverb AND minimmog bass! I think I may have read something in regards to this wholesale approach earlier, or at least suspected it. It makes sense that RD would have a large supply of unused compositions to draw from at any given time. Do you know whether music was ever recorded wholesale as well? Just add lyrics/vocals when required?